That’s the tentative conclusion of an analysis by Ranga-Ram Chary, a researcher at Planck’s US data centre in California. Armed with Planck’s painstaking map of the cosmic microwave background (CMB) – light lingering from the hot, soupy state of the early universe – Chary revealed an eerie glow that could be due to matter from aneighbouring universe leaking into ours. 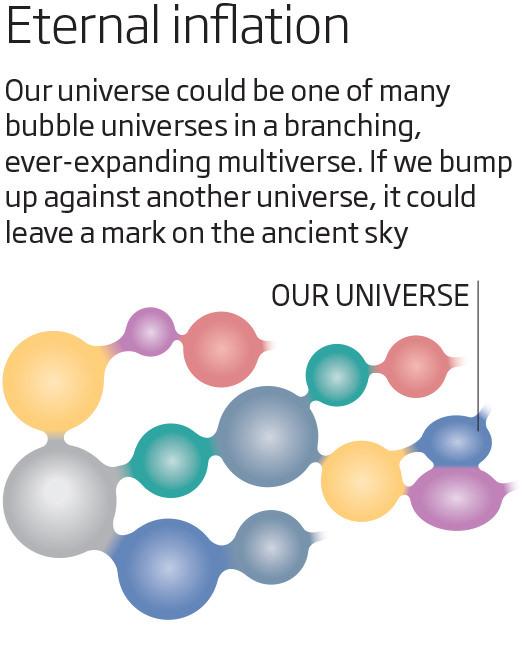 That notion could explain why the physical constants of our universe seem to be so exquisitely tuned to allow for galaxies, stars, planets and life (see “Just right for life?“). By 2011, they were able to search for them in data from NASA’s WMAP probe, the precursor to Planck. But they came up empty-handed. Of course there are caveats, and recent history provides an important reality check. In 2014, a team using the BICEP2 telescope at the South Pole announced another faint signal with earth-shaking cosmological implications. The spirals of polarised light, spotted in the cosmic background, would have provided more observational evidence for the idea of inflation and helped us understand how inflation occurred. But it turned out that signal came from dust grains within our galaxy.